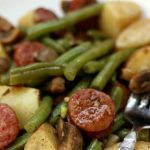 An easy one pot meal of cajun-style andouille sausage, quartered red potatoes, fresh green beans and sliced mushrooms. Drizzle the buttery broth over the potatoes for maximum flavor. Pour chicken broth into slow cooker. Cut sausage into thin quarter inch slices. Cut red potatoes into 1 inch cubes or chunks. Wash and trim the ends of the green beans. Quarter the mushrooms. Add the sausage, potatoes, green beans and mushrooms into the slow cooker. Sprinkle the cajun seasoning, salt and pepper into the pot. Toss with a spoon. Cut the butter into 8 pieces and toss them into the slow cooker. Cover and cook on low for 4 hours, or until potatoes are tender. Can I use another type of potato besides red potatoes? You can. Yellow potatoes will cook at the same rate as red potatoes. Russet potatoes will take a bit longer and I would peel the russet potatoes if I were you. Add 1 hour to the cooking time for russet potatoes.